A love of birds can grow into a passion for gardening. The reverse is also true. Sometimes these passions result in the development of excellent plants, such as Salvia x 'Margie Griffith'. Margie Griffith Sage is one of our newest introductions at Flowers by the Sea. We think hummingbird gardeners in the South and along the California coast, should make lots of room for this bountiful Salvia that grows up to 96 inches tall and wide when in bloom. Margie Griffith Sage is a 21st century hybrid that produces shiny, rough textured leaves and long, dusky purple flowers. It feeds hummingbirds nearly year round in some parts of its USDA Plant Hardiness Zones 8 to 11. Louisiana ornithologist and hummingbird lover Donna L. Dittmann developed this sturdy combination of S. mexicana (Mexican Sage) and S. involucrata (Roseleaf Sage). Dittmann is the collections manager overseeing and preparing bird specimens for the LSU Museum of Natural Science. Margie Griffith was a student in birdwatching classes that Dittmann and her colleague, Steve Cardiff, taught at LSU. The two women became friends. Dittmann notes that Griffith was an "avid and fastidious" gardener who caught birding fever. She became active in the Louisiana Ornithological Society along with Dittmann and their mutual friend, hummingbird expert Nancy L. Newfield. They formed a powerful sisterhood of professional and citizen scientists, whose garden discoveries helped develop year-round hummingbird gardening. When Griffith died of breast cancer in 2004, Dittmann memorialized her by naming the new sage for her friend. Unfortunately, she says, Griffith never got to see the plant, because it was new at the time she died. Years later, and with Dittmann's permission, Newfield gave FBTS a Margie Griffith Sage so we could make it available to a broader range of hummingbird gardeners in areas with warm winter climates. Dittmann's plant is what is known as an F2 hybrid -- that is, a second-generation of a hybrid. It's also a "back-cross" with a third plant -- another Mexican Sage that the ornithologist says is somewhat of a mystery. Many sages cross-pollinate easily. Also, rigorous hybridization records can be difficult to keep when you have little time in the garden. But Dittmann knows that one parent of Margie Griffith Sage was the Mexican/Roseleaf hybrid called Raven's Sage, which she developed in the 1990s. She adds that around the turn of the century, she experimented with S. mexicana 'Compton's Form'. Although Compton's Form typically has dark calyxes -- the protective sepals cupping blossoms -- Dittman's Compton's Form plants produced calyxes with combined black and green coloration. In a quest for pure green- and pure black-calyx offspring, she selected seed from various generations of the plant. At the same time, Dittmann was busy crossing Raven's Sage with other Salvias. However, she says Margie Griffith Sage, which has lime green calyxes, is likely the result of back-crossing Raven's with a "derived Compton's Form." Although it is a sun lover, Margie Griffith Sage tolerates some partial shade similar to Roseleaf Sage. Dittmann notes that Its leaves are rougher and less shiny than those of the Compton's Form still in her garden. Although the flowers begin as Roseleaf-style rounded buds, they lengthen into blossoms like those of Mexican Sage. Dittmann has been a serious birder since junior high when she took summer classes on the subject at the California Academy of Sciences in San Francisco's Golden Gate Park. By 19, she was renowned for her long life-list of birds sighted. Following graduation with a degree in zoology from the University of California at Berkeley, Dittmann eventually migrated to Louisiana where she is an avian artist as well as an ornithologist and educator. 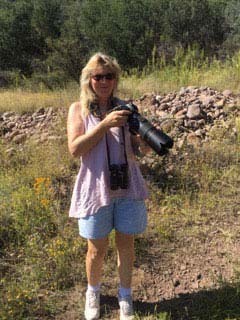 Pictures of her work and information about birding festivals she helps to organize are available on her Snowy Egret Enterprises website. Dittmann's schedule doesn't leave as much time for gardening as she would like. "I was not so fastidious [in the garden]," she recalls, "so Margie and I always joked about that." But Salvia x 'Margie Griffith' is no joking matter even if it wasn't the outcome of precision hybridization. Dittmann's scientific curiosity and persistence created a gift to gardeners and hummingbirds. We expect Margie Griffith Sage to be successful in gardens nationwide where winter is on the warm side and rainfall is average (as in not too dry or damp). We feel a kinship to hummingbirds due to constantly being in motion. Yet we're always ready to hover awhile at the telephone or on our computer keyboards to answer questions. So, please feel free to contact us at FBTS if you want to know more about wildlife gardening or any of our nectar-rich plants.